Sweet set of kitschy vintage pot holders. 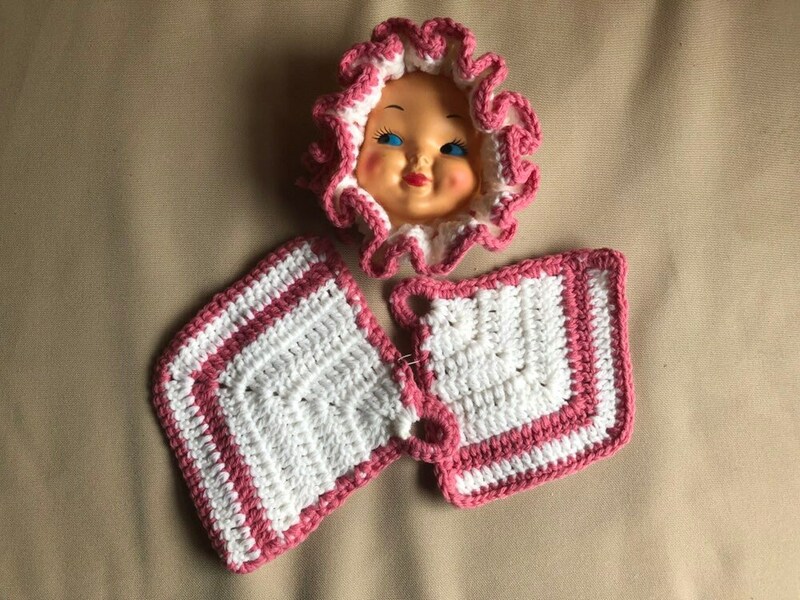 A sweet plastic baby doll face with a hook that can hang, and there's two potholders buttoned on the back. Clean and looking like new! Adorable! They are 8.5" wide and 7" tall. Rare Vintage Love Is... Kim Casali Boxed Set of Greeting Cards - 7 Cards and 8 Envelopes - Like NEW! Lot 2 Peaches and Cream Color 55 Light Green Yarn | Vintage Same Dye Lot 8425 | Approx 240 Total Yards | 5 oz.